It looks like it could fly away! The wings were Alicia’s Lace (#8 045) outlined with Gold Rush (202C) & couched with Accentuate (024). 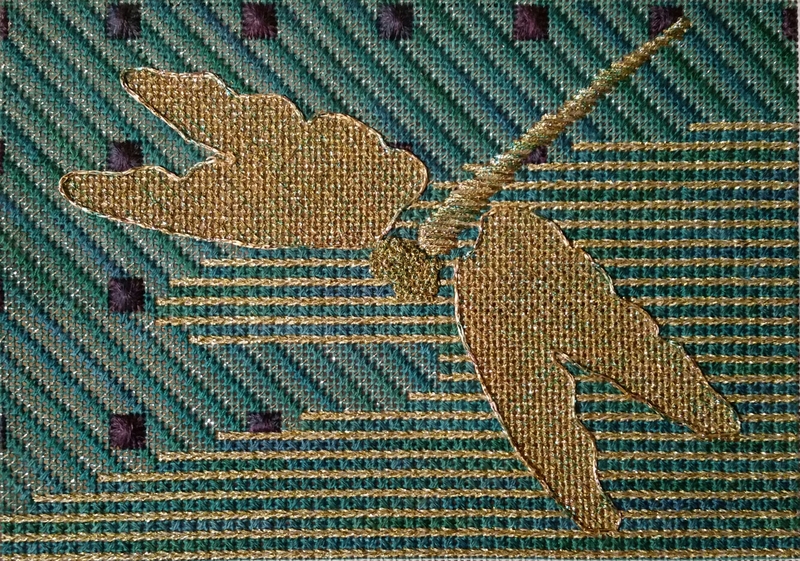 The body was padded first with long stitches of Crystal Braid (CR08) & covered by straight (satin) stitches Kreinik (#8 045). The head is French Knots (#8 045). It has been 2 years since I’ve done one & they were a snap thanks to a Mary Corbett video for a refresher! 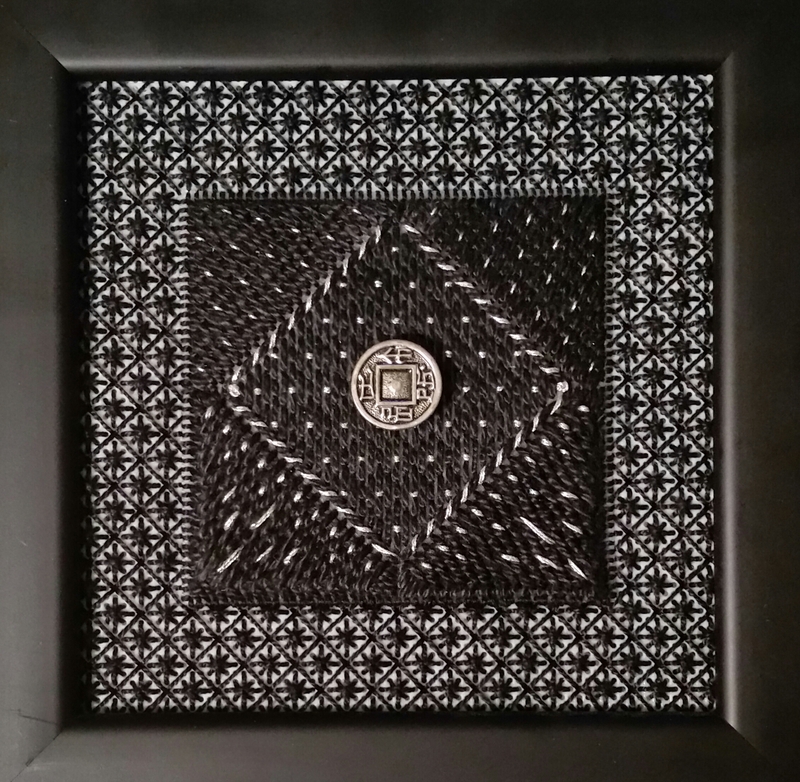 Initially, the small squares were going to be Rhodes stitch but Sharon G thought they wouldn’t compensate easily & suggested Double Leviathan but that pattern covers 4 threads & the square was 5 threads. So, I did my best with the Rhodes using Gloriana (#088 Seaweed). This is a 60th birthday gift for a friend, Terry V, who’s as cute as a button. It’s on 14 count vinyl canvas. 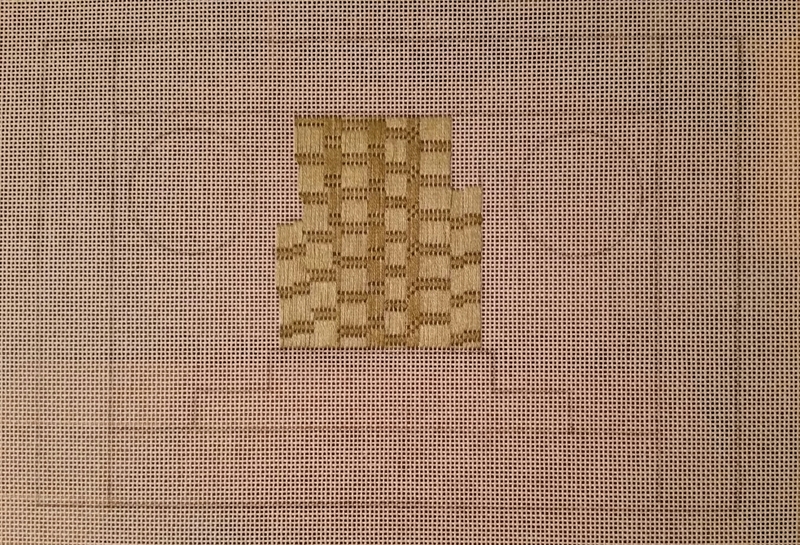 I didn’t start on this very early (I forgot about it until Tuesday & her surprise party was last night – fun time) so I kept it small (3&1/2″ square) to get done quickly (several nights & a day of binge stitching). A little DMC & Kreinik to add some sparkle. I have some decorative buttons that I have had stashed away & thought it looked good. And, because I used simple stitches, I got done quicker than I expected & decided to add the background for a finished 5″ square design. Whew! These just arrived from needlepoint.com ‘s recent give-a-way! 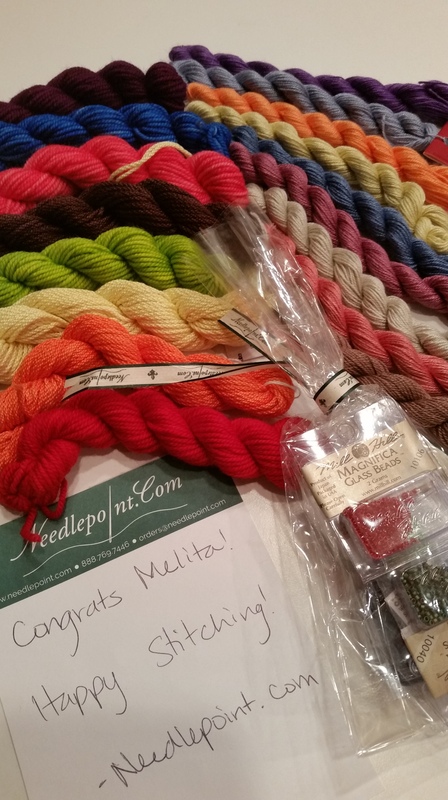 It includes Claudia hand painted cotton threads (3-ply), a brand I have not seen in Pennsylvania! The selected Impressions & Mill Seed beads match perfectly. I am Programs Chair for ANG Main Line Stitchers in Devon, PA (outside Philadelphia) & will figure out how to share this with them. Thanks needlepoint.com! 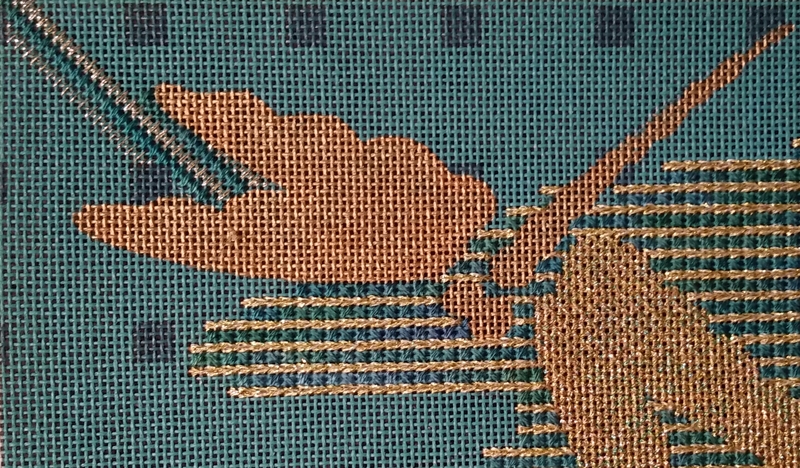 According to Sharon G, the background is supposed to look like rain but the notes I took during class didn’t have enough details especially considering that I waited years & not days to get back to stitching this piece. Ideally, I should have stitched some in each area or at least taken better notes! Now, I realize that the note about the Damask stitch pattern on page 48 referred her book, Simply Essential Needlepoint Stitch Explanations, that I must have bought that day. I just found it while looking for another book. And, I realize that I stitched the whole background differently than Sharon had intended. 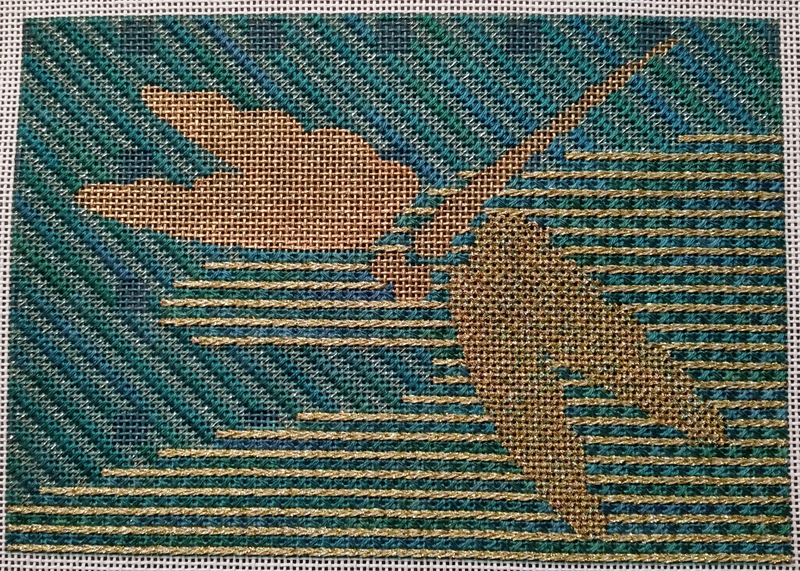 This stitch pattern would have been on the green background but you can see it is more open & looks like rain. 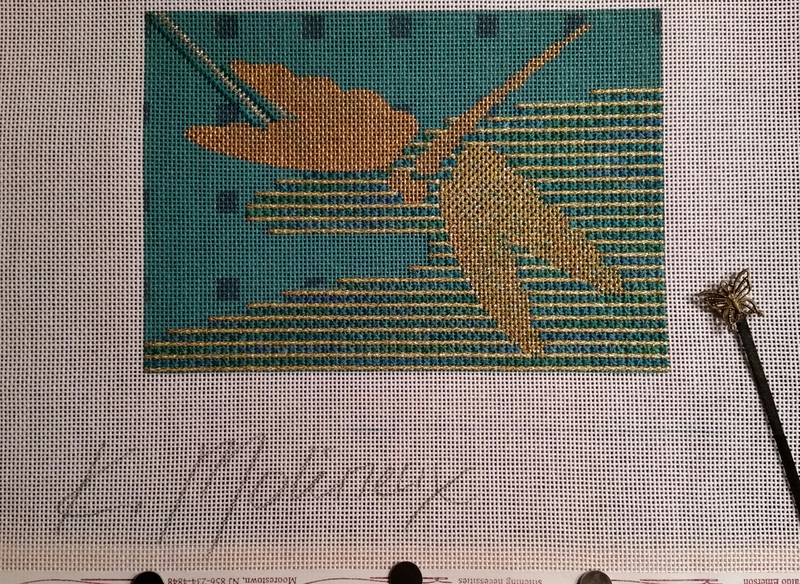 Initially, I stitched the top row gold (using 2 strands of Accentuate) and thought it was too heavy. So, I tried 1 strand (bottom row). And, I decided the 1 strand of the Accentuate was better! 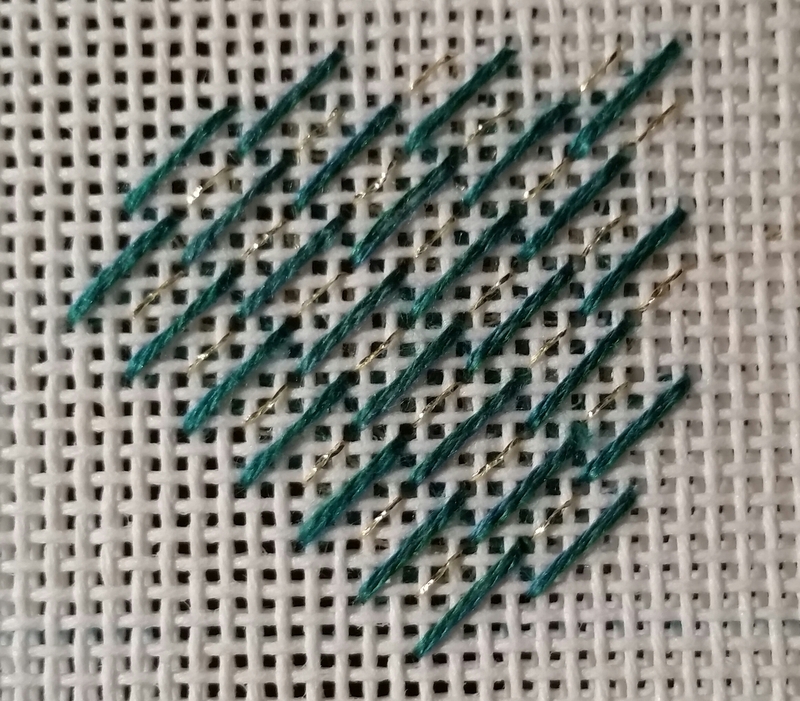 The green rows are the same thread, 2 strands of Peacock Blue (192) Gloriana. To prevent streaking, Sharon suggested alternating between 5 x 18″ lengths and reversing the direction of the threads. I have delayed posting this as I contemplated my options: (1) rip it all out & start over – I have enough thread, (2) cover some of the gold with or without adding some gold on top of the green, and (3) do nothing. Oh well, it doesn’t look like rain but I can live with this!! What would you have done? Take 2 for the bamboo. I knew I had to redo it after Bill asked me what the other version was (after I told him 3 times). So, I studied images of bamboo & realized my color was way off & had to figure out how to make it more realistic. Hopefully, you’ll agree as does Bill, “It looks like bamboo. ” What will clue 2 be? I mentioned in my “Plans for 2015” post, that I had a Dragon Fly painted canvas. I knew it was from a Sharon G class I had taken at Nimble Needle but had forgotten it was a Kathryn Molineux painted canvas. Sharon provided the stitch guide. Since that was the most completed of the works in progress, I decided to start stitching that piece & have been working on it for the past few days. And, I was shocked to read today that Kathryn passed away Dec 26, 2014. So, I am really glad to share my progress as a tribute to her memory. 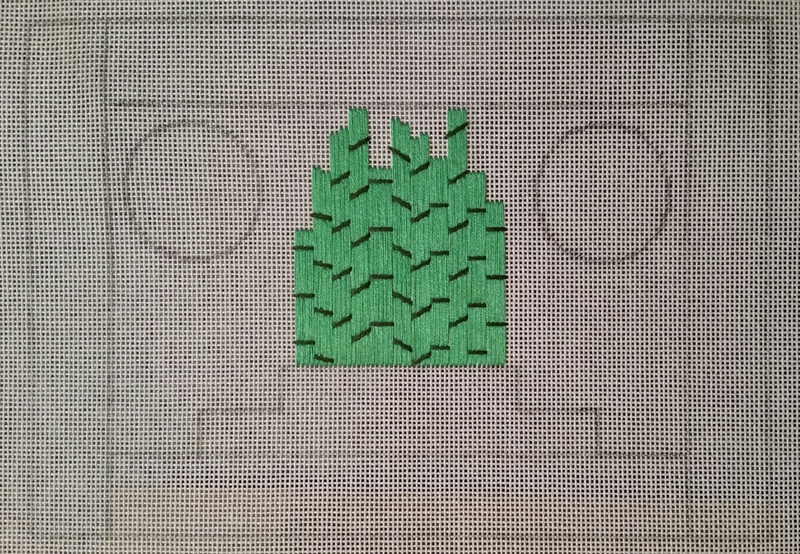 The first clue in the Stitching Games 2015 run by stitcherie is “pickle”. I had an idea of a tea tray getting a Chinese motif of either a bonsai tree or bamboos. And, with pickle being green either would work. As you can, I hope, I selected bamboos. Is there any chance you can see this? I can redraw the design & redo it – I have the whole month. Thoughts?